here is currently 1 sailboard hire and tuition school. 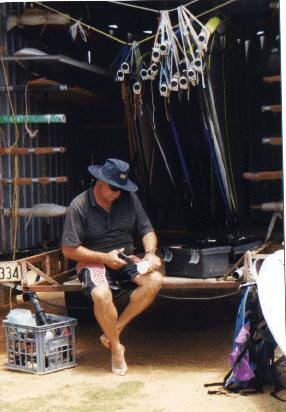 The longest established sailboard hire business in Lancelin is Werner's Hot Spot. Werner (pic) is a long time resident of the area and has hired out gear and sailed the area for many years. He also arranges holidays and tours for Europeans to visit and Sail Lancelin. He rents his gear from a large trailer on the lawn in front of the main sailing beach (picture). This picture shows him doing the books in the trailer. You can rent gear by the hour, half day or week. Werner updates his gear every year. Current details can be found on his home page. Werner also has a set of beginners boards, and can provide windsurfing lessons. He will also arrange transport to and from Perth, as well as car hire for your stay in WA. If you intend hiring gear from Werner, it is well worth booking the gear you require in advance. I find it best to Fax. 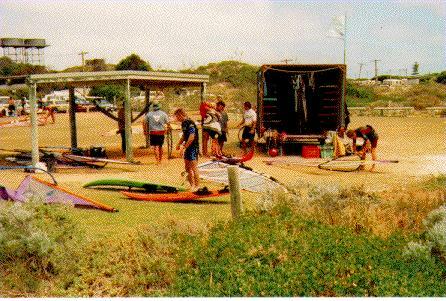 You can also change boards and sails as required by the conditions while in Lancelin. His web page details his services and gear.